Scorched but resolute after a prescribed burn, broadleaf cattails (Typha latifolia) stand tall in a Brazoria Wildlife Refuge slough, their fluff a token of the regeneration and new life to come. Call it a study in sepia. I’ve never once seen a cattail as the tail of a cat. So much for metaphors in names. If nothing else, the photo proves that a cloudy, windy day without pretty flowers scattered about still can provide some worthy subjects. I didn’t fully understand the cattail metaphor myself, until I starting living with a cat. When Dixie Rose becomes frightened or defensive, her tail stands straight into the air, and fluffs out until it’s three times its normal size. At that point, the resemblance is a little more clear. I’ve actually been missing cattails — around NY, they’ve been crowded out by purple loosestrife and non-native phragmites. The state & feds do some controlled burns on public lands to control invasive species, but a lot of the farm ponds and small marshes are totally overrun. After I read your comment this morning, I made a pretty wide detour. I knew I’d heard of purple loosestrife, and sure enough, it’s on our list of invasive plants, too. What’s particularly interesting is that there are people promoting Lythrum virgatum as a nice option for Texas, even though it’s also listed on some sites as invasive. Trying to figure out exactly what they’re talking about is tough, because even some sites that are advice oriented don’t always use the scientific name. The non-native phragmites were new to me. I still have a hard time sorting out all the plumed grasses, but i’m pretty sure I’ve seen these. Phragmites sounds like it ought to be a geological term, and I kept stumbling over the phrase “phragmites is.” Apparently the plural of Phragmites is — phragmites! Phragmites sounds like alien space invaders, or maybe ancient Greeks who used to pester Odysseus or something. They have nice plumes but you can have too much of anything, and we definitely have too much. This image took my breath away! I love the movement it evokes and the lightness. What amazed me, Pete, is that the fire raced right past the tightly packed seed heads, scorching them on the outside, but obviously allowing them to keep right on developing and releasing their seed. When I first saw the ditch filled with the most fire-damaged, I had to laugh. The general discoloration and black streaks made them look like they were wearing camouflage. But you’re right: the stiff wind and blowing fluff did make for a nice image. Thank you, so much. I was happy to find such interesting subjects. My mother used to talk about soaking cattails in kerosene and using them as outdoor torches – that would have been in the 1930s or so. Given how well these stood up to the fire, it makes it easier to imagine doing so. I just read the funniest advice on a Florida canal-dwellers’ forum about how to clear out cattails from a channel without risking life and limb with the alligators. They advised heading down to Publix or wherever and getting a couple of $6 chickens. Toss them over to the other side of the canal, and do your plant trimming and removal in safety. Well, relative safety, at least. Yes, they do love their chicken dinners! These look like fall to me — blowy and brown. I love them. Before they start to shed their fluff, I think cattails feel like cut velvet. I can’t remember from your photos — are there cattails at the Ditch? Have you ever used them for fall decorating? I’ve seen some arrangements with cattails, fall grasses, bittersweet, or gourds that are really attractive. But you’re right — they’re as much a part of fall as the pretty leaves. Beautiful–movement, warmth and light. Quintessential Texas autumn. We do have much to celebrate, don’t we? It’s always a pleasure to find a sepia-toned landscape, and to find one with a few marks of “experience” is even better. I love the flowers, but the charms of a quieter season can’t be denied. I was astonished to see how much work has been done at the refuge, too: not only mowing and burning, but new fencing, replaced culverts, newly-dredged drainage ditches, and so on. I have on my to-do list finding out how many permanent employees they have, and how much contract labor they use. I suspect it’s less than we’d imagine, but the results are so good. What a great subject to photograph and as you know I love the details in the landscape around us. Whatever the season Nature always has something beautiful to look at. One thing you and I have in common is an appreciation for what can be enjoyed locally. It’s easy to assume that the “good subjects” are always “out there” somewhere, but as Sportin’ Life sang in Porgy and Bess, it ain’t necessarily so. One of these days (and soon, before it gets too cold) I’m going to sit down on my front step and do some portraits of the lizards running around. There still are some young ones, only a couple of inches long, and they’re the cutest things in the world. Will look forward to them, Linda. (to be honest one of the reasons I try to get outdoors locally is the exercise, but if I had a car, good health and the finances, I be travelling around the whole of my state’s coastline – I have to say it is stunning and I wish I could share it online. But if I had the health, I suppose I’d still be working full time, which would only leave me the weekends to explore. But seriously, I wish I still had a car and could drive as now I have a decent camera, I can think of dozens/hundreds of fantastic places to do landscape photography). I’m surprised the cattails weren’t more burned, or did they releaf? The red wing black birds love them some cattails. I can hear their calls in my mind’s ear. There was a playa across the street from my bank where there was a good stand of cattails, but the City has kept them mowed these last couple of years. Don’t know why. Perhaps the fire hazard as we have had some high fire danger days here lately and people will insist on tossing burning cigarette butts out their car window. The cattails in question were within tossing distance of the street. Ruddy ducks like them, too, I believe, as well as other duck and wader species. No, the cattails (and other plants) were already mature and heading toward seed. Here’s my theory. Grassland fire moves really quickly (as you know) and cattails’ seed heads are really dense. I suspect the fire moved too quickly to affect anything but the surface of the seedhead. On the other hand, you can see that the stems are more blackened. The day I was there, water was standing in the ditches again, but I don’t know whether they had drained the water before the burn. They have quite a complicated system of pumps that can move water from one place to another so that they can do maintenance, control salinity, move birds — who knows what wonders are accomplished? There were some birds poking around in the midst of the burned areas. The wind was so strong that one mixed group had hunkered down together: snowy egrets, great egrets, white ibis, and glossy ibis all in one group. Some were juveniles, too. Photos to come, eventually. That’s a cattail blizzard! I love cattails because ever since childhood I’ve associated them with pheasant hunting. And “cattail blizzard” is a perfect description, Terry. It’s interesting that you associate the cattails with pheasant hunting. When I think “pheasant,” I think corn fields — natural for someone from Iowa, I suppose. I haven’t seen a pheasant since the last time I was in Iowa, in 2011. They’re beautiful birds, and exciting to see take flight. An excellent capture of “fluff in the wind.” I have always really liked cattails and years ago I would go out to the farm and cut a few to bring back to place in a large heavy vase. When they began to fluff, I of course, had to throw them out. I never thought about trying to grow them and I suppose the seeds would not spout unless they had constant water. I think your image is excellent and shows how the cattail disintegrates. It is very pretty. The answer, Yvonne, is hair spray! It doesn’t matter what kind, or how much you pay. A $1.97 can of Magic Net does as well as the fancy stuff. Just spray your cattails well, let it dry, and your vase time is extended substantially. How’s that for news you can use? It is fun to watch them begin to throw their fluff to the wind. As for planting them, I don’t know much, except that you can start with seed or by dividing the underground tubers. You’re right that they require constant moisture. I did read that they can tolerate up to two feet of standing water. I wonder if they could be grown in something like an old metal wash tub? I’ll bet it would work — like a tiny water garden. They are pretty as can be, and for once, the evidence of fire adds to their appearance rather than detracting from it. Strange to think of cattails, which grow in wet places, being burned. I like the windiness of this image! I don’t know this for certain, but I suspect that the intent was to burn off other grasses, sedges, and such, and the fire damage to the cattails was secondary. Much of the old cane has been mowed (or plowed down) and in some cases, both fire and mowing have been used to clean up the bottom of the ponds before allowing new growth to start. There’s so much I don’t know about land management! I like the windiness, too! What a wonderful song. I’ve always enjoyed Lightfoot, but I’ve never heard this one — thanks so much for adding it! I used to have his song book and this was in it. And so many other great songs. A real master. I agree. It’s a shame that so many people today don’t know his work. There are a number of Canadians in my pantheon of greats — Ian and Sylvia come to mind, particularly. What I’ve never seen is their flowering. I’ve tended not to notice them until the seedheads begin to form. One of the lessons I’ve had to learn is that things happen more quickly in nature than we sometimes expect. A week can be long enough for grasses to overcome early flowers, and I suspect that many of these water-loving plants develop more quickly than I’ve thought, too. Beautiful photo, Linda! Just goes to show that Nature rises above challenges and produces something lovely in spite of them. And sometimes she produces something unusual and lovely because of them, don’t you think? Vines especially can do that. With their growth blocked this way and that, they still find a way to twine their way into new and unexpected places. Nothing amuses me more than a tendril waving in the air, feet off the ground, as though looking around for its next destination! Ponds weren’t part of my growing up years, although they surely must have been around. It is remarkable what complex and interesting world a pond or slough is. I can imagine your favorite pond played quite role in shaping you into the outdoorsman you are — as well as nurturing that love of exploration and discovery that’s so much a part of you. I think they’re beautiful, too. It’s so interesting that they can be marked by fire without being consumed by it. When I see results like this from a controlled burn, I’m always impressed by the expertise of the people who can manipulate natural forces for human good — even though sometimes things don’t always go exactly as planned! Two of my favorite fluffs are cattails and milkweeds.I enjoyed seeing some movement while still seeing detail in a few of them. I was fairly well surprised by the way this came out, as I was using aperture priority. Once I saw the result, and looked at the shutter speed, I started playing around with blowing grasses, and finally began to get a grip on how to set both aperture and shutter speed, instead of just one. 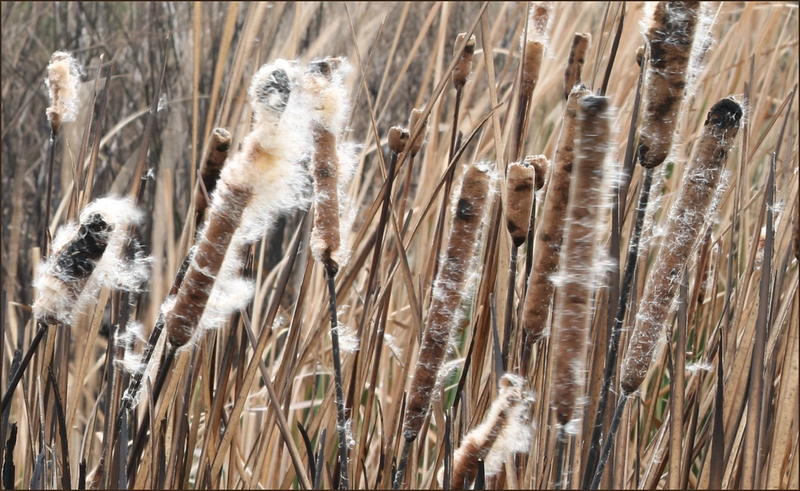 Yesterday, some of these cattails still had explosions of fluff on them, but many were nearly bare. Things happen fast in nature: sometimes far faster than I’ve imagined. I may get more opportunities to photograph milkweed fluff this year. Also yesterday, I found a stretch of ditch covered with blooming green milkweed — and bees. Go for it, of course. It is the same with moving water. There are a few basic exposures that work well but the variation of water speed and ambient lighting really requires some experimentation. I had no idea what you were talking about when you mentioned peanut butter and fluff. I’d never heard of such a thing as a fluffernutter, even though I see it’s famous enough to have been proposed as the official state sandwich of Massachusetts. Honestly? I’ve never even tasted marshmallow fluff. I guess I knew it existed, but it never showed up in our kitchen, so I never found a use for it. I make my fudge without it, and I make my meringues with egg whites — maybe I should expand my culinary horizons. If I do, I’ll be sure to report! Be sure to get the real thing and not a copy cat marshmallow creme. I do not eat white bread, but it’s a must for a fluffernutter. Just like for the old Iowa standard: fried bologna on white, with mayo. We’re even now…never heard of that one although I did grow up with bologna (aka baloney in these parts) as my father had a deli for a few years. I think the only time i had it cooked was in eggs. We discovered it at the head of a column of odds and ends in the Picayune, the first day; heard twenty people use it the second; inquired what it meant the third; adopted it and got facility in swinging it the fourth. It is the equivalent of the thirteenth roll in a 'baker's dozen.' It is something thrown in, gratis, for good measure." Why Pair “Lagniappe” With “The Task at Hand”? I love to write, and "The Task at Hand" always will be my primary site: my place for essays, stories, and poetry. On the other hand, photography has opened new worlds to me. Now and then, I take special delight in a photo, and have wanted a place to post those I enjoy. This is that place. You're welcome to consider it lagniappe -- a little something extra -- and I hope you'll find an occasional delight here, as well. The text and photographs on this site are the property of Linda Leinen. You may link to these entries, but may not use either photographs or text without written permission.